Welcome to my next BOR AAR! After strangling Rome in its cradle with the Samnites (which was very easy because of some strange AI actions), it is time to do the same with the Senones but this time I will play against Jim (jimwinsor2) and not the AI. Propably won't be as easy as last time! Note that I only played a few turns of this scenario. I have no idea of the events and decisions. Which I think makes it double as exciting! It might however also mean that I say things that are wrong. I'll try and include a few more pictures this time as well so it's not just a wall of text. I put in Italic some questions I have and I would be very happy if there are people that can answer me those! I only included the upper part of Italy in my screenshot because there is not much to see in the lower half: as in the Samnites scenario there are several Greek colony cities and of course the rest of Italy is Roman or Roman allied. The Greek cities are again neutral, but let's see if it will stay this way! Britomaris and his 40.000 men are eager to go to battle and I won't deny them the favor! First of all, I am sending a weak infantry unit of Britomaris army into Arretium to besiege it. Now comes a very hard decision: go to the Romans.. or let the Romans come to me? If I stay out of the vicinity of Rome (which means: out of Spoletium and/or Perusia) they won't be able to call in a dictator. Dictators come with two legions. I will have a hard time against four legions so unless I have destroyed the already existing legions advancing closer to Rome would be suicide! But it isn't as bleak as it looks. If I were to just hold all the provinces I have right now plus Arretium which should hopefully surrender soon (unless relieved) I'll get a lot more Victory Points than the Romans. Also, in a few turns I will hopefully be able to call in the Boii which would nearly double my strength. So: Britomaris stays in Sena Gallica and will "hold at all cost". If the Romans decide to attack me they will be met by a dug-in army in wooded terrain. I don't know which terrain is actually advantageous to me: clear, because it has a bigger frontage and allows me to employ all my troops at once? wooded, because it is better to defend? Someone able to explain this to me? 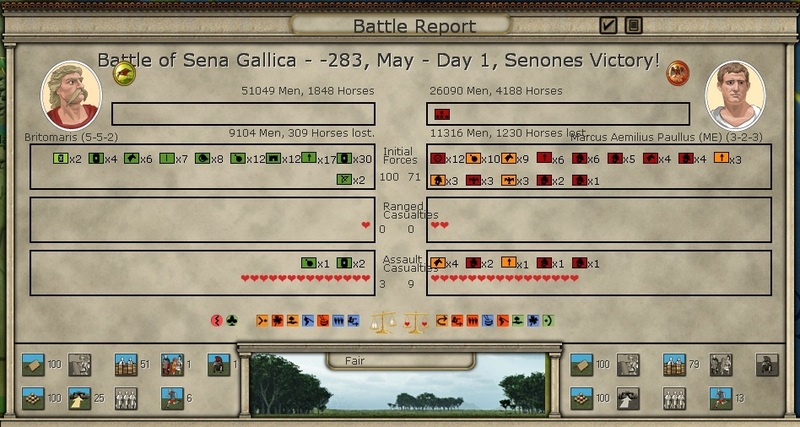 As suspected, the Romans launched their first attack on Sena Gallica. Britomaris army is able to hold but he suffers significant losses. Over 25.000 dead litter the battlefield. Neither army has been decisively defeated and both armies are now in the Sena Gallica province. Can someone explain to me when exactly an attacking army will retreat after the defender has won and when it will just stay in the same province as the defender? Is this random or how does it work? Britomaris wants a decisive defeat and orders his troops to attack! Bolstered by a Bellatores city garrison unit his troops still have a strength of 1100 and number 24.000 men. The next month will propably be decisive: a Roman victory means they will be able to relieve Arretium. A Roman loss will allow Britomaris to bring his army up to strength again and consolidate Arretium after it falls. Much is at stake! 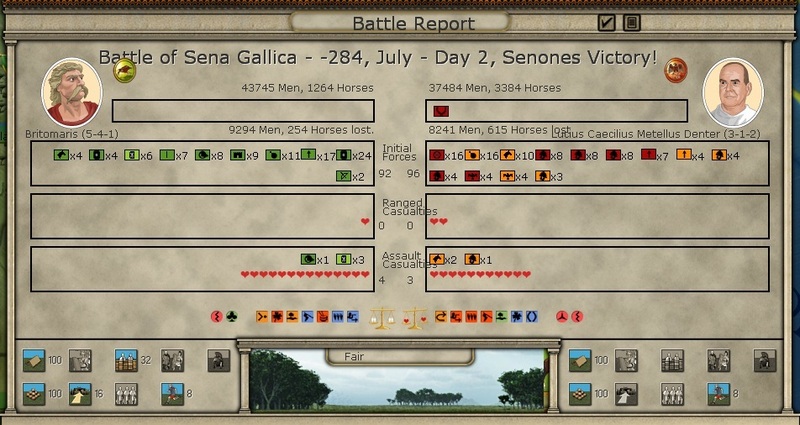 Another bloody battle finally forces the Romans to leave Sena Gallica. Both sides suffered heavy losses again but even though Britomaris technically scored a victory – which is great because it gives me National Morale and Victory Points – I lost three of my Gallic Bodyguard infantry elements, very good fighters obviously and as far as I can tell impossible to replace: they are the only Gallic troops I have, the others are Celtic and I can't buy any Gallic replacements. And another thing is worrying me: see how the Romans already brought over 37.000 men to battle again? They replaced most of their losses already! That's anything but a decisive defeat, two turns and they'll be able to attack me full-strength again. However, I also replaced many men again before battle, which ensured my victory. And I still have lots of money and lots of replacement chits which means next time the armies meet I will hopefully be full-strength again as well – apart from my Bodyguards elements which will weaken me a bit I fear. Nice AAR, thanks for sharing you too! A quick comment: it seems like you gave Britomaris a defensive posture because he staid in Sena Gallica, waiting for the Romans to attack. 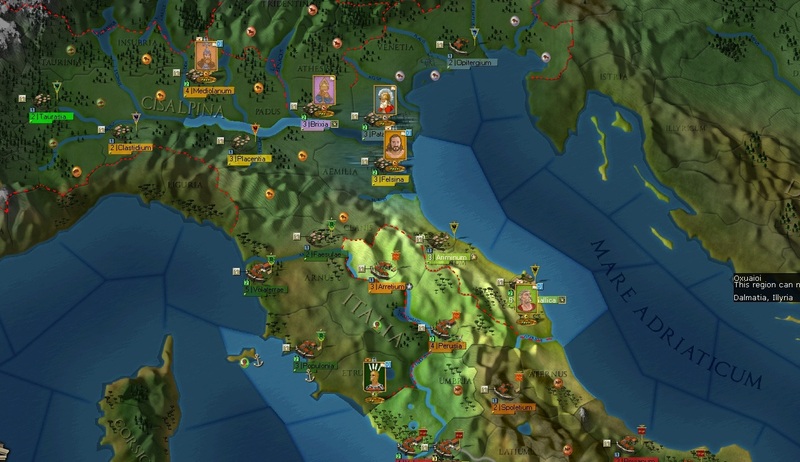 But the game engine is more refined, and you could let the Romans make the move towards Sena Gallica... and still adopt an offensive posture to use your 4 attack rating instead of 1 defense rating. I bet that it would have outweighted the benefits of trenches... and beside, Celts staying in their trenches instead of going to the enemy and organizing an ambush, really? I was wondering if it is better to put them on the offensive or the defensive. I decided for defensive because that way I could set "hold at all cost". Maybe it would have been better to put them on the "offensive defense" instead. But you can see from those two battles: first battle was defensive, second was offensive and although I actually won the first battle in the second one - where I attacked - I caused less losses and I lost some precious elements. Didn't seem to me like such a big advantage of setting offensive posture.. The Roman army is currently camping in Perusia, led by Caius Servilius Tucca (one of the new Roman consuls, if you don't know: the two Roman consuls get replaced every year, regardless of their performance or military skill). Either way, the legions are threatening my siege of Arretium and I have to take that town as fast as possible. Britomaris will attack them with everything he has: 34.000 men with a strength of 1512. Quite a bit less than the 1800 strength force had at the beginning of the game. Unfortunately the infantry unit I am currently recruiting needs 6 more days and I can't use it for the attack. On the political side of things, I did not gain any Engagement Points since the start of the conflict. This is not good because I need five more to call in the Boii tribe which would nearly double my military strength. 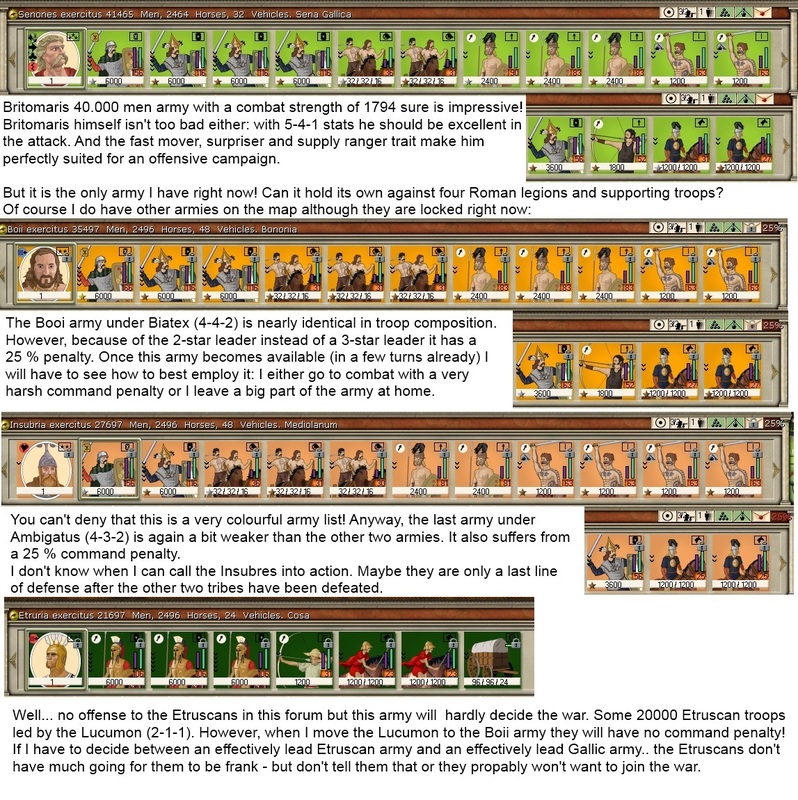 I could call in the Etruscans for 5 EP already but this will propably give me more disadvantages than advantages: they are rather weak (I showed their forces in the army table) and because of their close proximity to Rome it might allow the Romans to appoint a dictator, something that I want to prevent at all cost. An unlucky turn! I did finally force the garrison of Arretium to surrender but the Romans, as expected, moved to Arretium and quickly forced my besieging infantry unit to retreat. So far, so expected. But Britomaris, although actually managing to win a smaller engagement in Arretium with ~4000 losses on both sides decided to retreat from Arretium! Can someone explain to me why? Did Britomaris "decide" that the enemy is too strong and retreat into a home province or what happened here? This is terrible news because if I had taken Arretium back I could have gained 15 more Engagement Points allowing me to call in both the Etruscans AND the Boii! As it is now, Britomaris has to retreat to Sena Gallica. 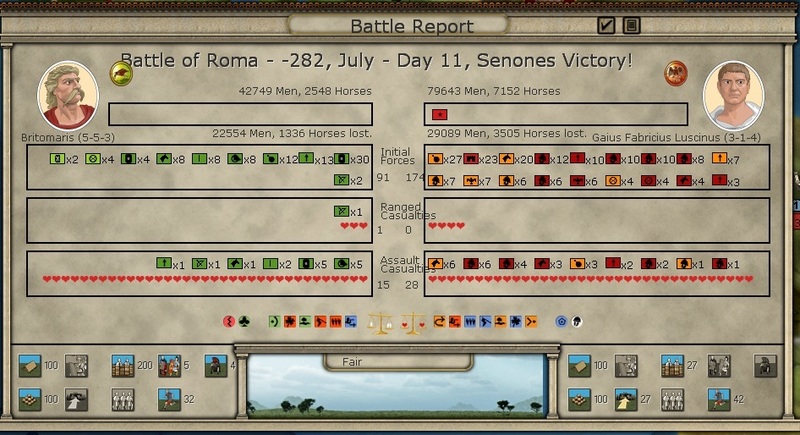 However, my position is not as bad as it might look at first: thanks to winning all larger battles I have 73 Victory Points while the Romans only have 28. Since we both gain 6 per turn unless the Romans either win a major battle or take one of my provinces I am far ahead on Victory Points. Two boring turns to wrap up the year! Britomaris and his army safely arrived in Sena Gallicum. With the newly recruited infantry unit the army is bigger than ever: 43.000 men, a combat power of 1745. The slightly lower combat power than at the start when it had less men is easily explained: loss of some irreplecable bodyguard elements which are my strongest infantry units and the loss of some experienced elements that have been replaced by unexperienced ones. Nothing happened at all. Are the Romans preparing for the attack? We go into 285 BC basically like it was at the scenario start: the ownership of all provinces is still the same, the armies are basically the same and both the Romans and me should be full-strength again. But Victory Points are on my side: the Romans have imposed requisitions multiple times and currently have negative Victory Points while I have 91 VP. I think it would be very hard for the Romans to win by Victory Points. But if they are able to take my provinces, of course I lost anyway! A horrible sight: the Romans were able to call in a dictator! 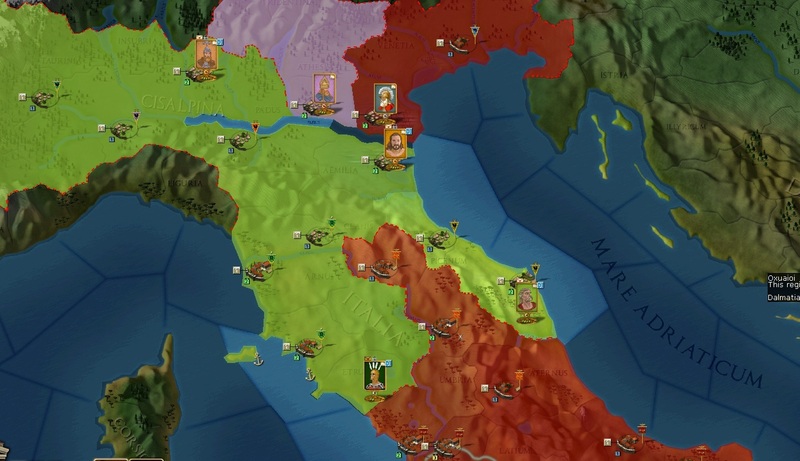 But they have split forces and now there are three legions and three Socii legions besieging Ariminium and the same amount is defending Perusia. Jim would propably expect me to relieve Ariminium first which is why this is exactly what I am NOT going to do. Britomaris will attack Perusium but not besiege it: he will instantly move to Arretium and assault that fortress. Apart from that, the reason why I was reluctant until now to call the Etruscans in was that they are close to Rome and might allow him to call in a dictator. Well, he now called in a dictator anyway so there's no reason for me to keep the Etruscans out of the war! 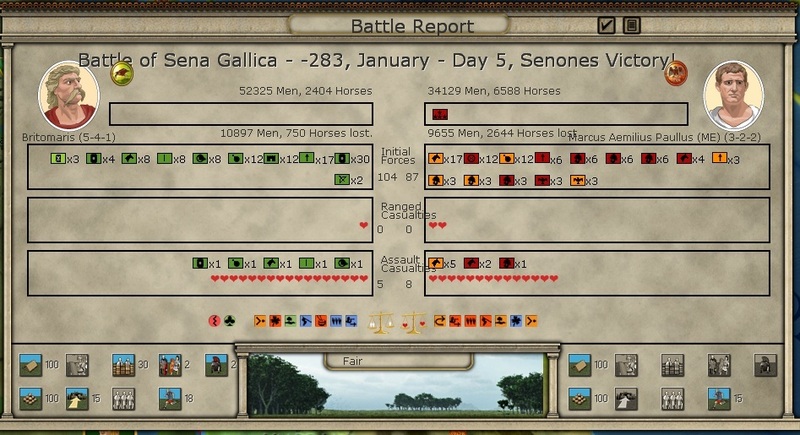 Another bloody battle in Sena Gallicum. The Romans are persistent! Their persistence is costly, however: they lose 18000 men in total and take another 50 hits on the retreat. Britomaris army suffers as well with 16000 men dead, but at least the Romans are repulsed. After defending so much in this game it is only reasonable that Britomaris improves his defensive skills: he levelled up and is now a 5-4-2 leader instead of 5-4-1. Very nice! Sena Gallica held – unlike Ariminium which surrendered after a single month of siege. These cowards! 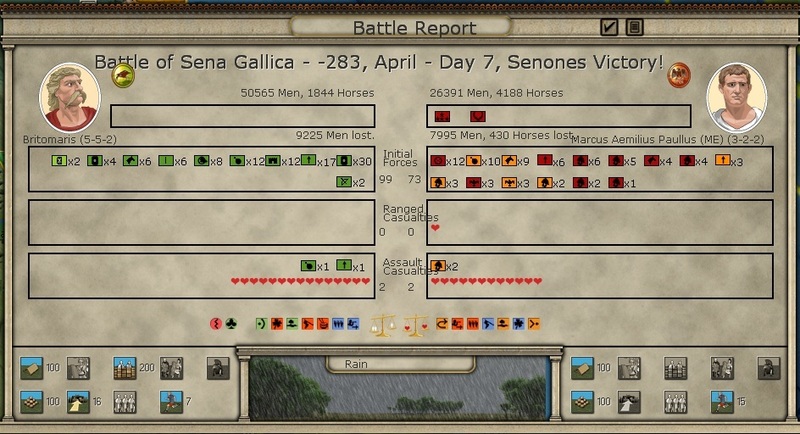 Too weak to counter-attack this month, Britomaris orders his men to hold Sena Gallica at all cost yet again. Another month, another bloodbath: C. Servilius Tucca orders yet another attack into Sena Gallica. Another 12.000 men wasted on each side. I don't know if Britomaris battered army can hold out if the Romans attack with everything they got... propably not. But there is nothing I can do other than defend. Right now my only goal is to delay the Roman capture of Sena Gallica as long as possible. At least my national morale is at 126 points because Britomaris technically won all of his battles until now! Have you tried yet to activate the etruscans ? Another, smaller battle is won in Sena Gallica but with more losses for Britomaris' army. We finally pushed the Romans out of Sena Gallica! Time to free our people in Ariminium again (even if they really didn't earn it.. surrendering after one month.. cowards)! A few elements of Britomaris didn't take part in the attack this month in order to recover again and with those units Britomaris' army has a strength of 1400 again. Unfortunately a chariot unit that was lost a few battles prior is still in the process of rebuilding and will take another 16 days. A game dev who actually cares that his game is working properly that's great! Maybe you can help me with a question I have: it's the Italic part in Turn 16! Now the Etruscans finally enter the game and I have to say: they are not all bad actually as you will see in later turns! As expected we took Arretium back without any major casualties. Absurdly, we did have to fight two battles in the region: one with the Roman garrison – and one with slaves which spawned because the Romans enslaved our people! That means we basically fought against our own people... but at least we.. WHAT? THEY DARED ENSLAVE OUR PEOPLE??? We'll be the last to laugh when we enslave ROME!!! I should by the way also note that my war economy is being sustained "the Barbarian style": I make so many Roman prisoners that I am now able to sell them for the third time. Each sale gives me 200 Denarii, more than enough to buy replacements for the losses my army sustained! Why does this keep happening? If you read last year October, the same happened there too: Britomaris just retreats without actually losing the combat decisively! I checked the detailed battle report and my units still had between 100 and 300 cohesion so why did Britomaris retreat again? Do I have to set him to "all-out attack" to make any gains? At least the Etruscans finally joined the war. Even though they are not all that strong, I already consider it a victory that they tie up Roman troops: if the legions don't attack the Etruscans they have to garrison Arretium to keep me from taking it with the Etruscans. Either way, they tie up some troops and that's great! What's not so great: Volaterrae, the capital of the Etruscans, is an objective for the Romans and if they take it they will gain more Victory Points. 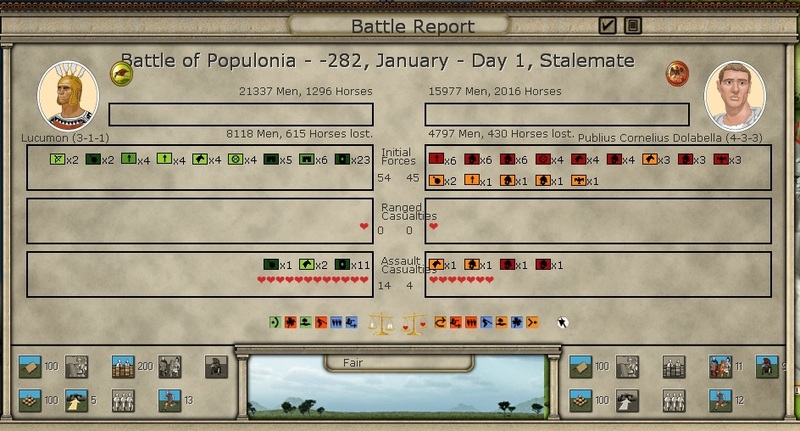 On the other hand, VP are not really a concern for me anymore: with all the requisitioning, enslaving and losing battles the Romans are now at -60 VP while I have 378! That's a huge difference and they will hardly be able to catch up since half of the scenario is over already. The question is: are 16 remaining turns enough for the Romans to capture my provinces? Interestingly, the Etruscans also have the possibility of building a navy (2 units with 50 warships each). Right now I can't afford it, though – and the usefulness of a navy in this scenario is questionable anyway. Regarding Britomaris retreat, the best would be for you to provide a save (with backup1) of the turn with that battle. I will forward it to the masters to check if something is not WAD. Yeah I am using the beta patch. I guess it was the cohesion - 100 is very low, right? The Etruscans lost a small battle in their capital Volaterrae but they lost only 1 element and retreated to Populonia. I never expected them to do much good but now they tie up three Roman legions that besiege Volaterrae! Britomaris' army is now again 100 % ready for action with an awesome strength of 1872 (!) - that's 100 strength more than it had at start! This additional strength displayed in the game is propably mostly because Britomaris levelled up again (I don't really know why he did, he wasn't in any battle but maybe I just overlooked it earlier) and is now a 5-5-3 leader! Which means that even in the defensive he is not bad now. the Etruscans are getting ready for a counter-attack. They will propably get destroyed but it would be a "waste" not to use the Etruscan army while their capital is under siege! 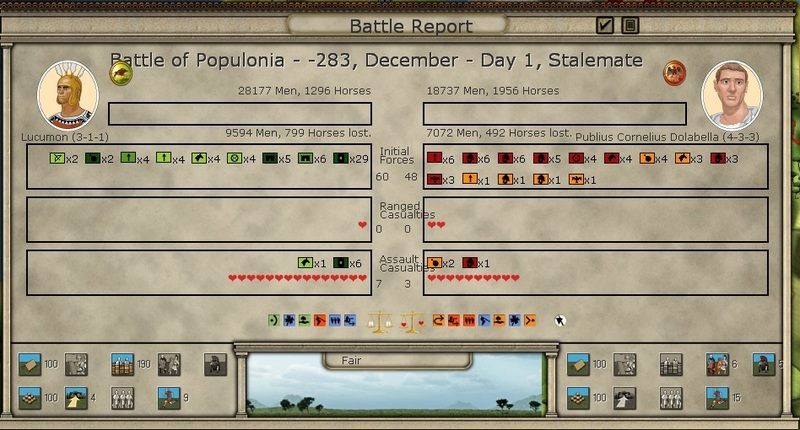 Speaking of using armies, Britomaris is really eager to go to battle: his army with a strength of 1875 and 43000 men would propably beat the Romans any day! However, there are three reasons why I won't attack right now: first, it's October already – winter is coming! - and Britomaris barely gets supplied because of a drought two turns earlier (at 80 % supply right now). An unsupplied 43000 men army is not something I can use right now! Secondly, I have only 80 denarii remaining which means I can barely pay for any replacements. Third, advancing onto Perusia or Spoletium would mean the Romans can call in another dictator. Of course this inactivity of Britomaris might also have a nice side effect: the Romans underestimating the Senones' strength and advancing into my territory – ready to be crushed by my warriors! The Etruscans have now taken both Volaterrae and Faesulae from the Etruscans who never had any hopes of winning against the Romans in battle. At least Britomaris gets left alone in Sena Gallica. His warriors are getting restless, but I am just not in a position to fight any battles right now due to lack of money. The Etruscans are really fighting for survival now... their last remaining city, Populonia, is getting attacked by three Roman legions and one Socii legion. Another 20.000 men get thrown into the meatgrinder that is this war. At least the Etruscans still hold Populonia. 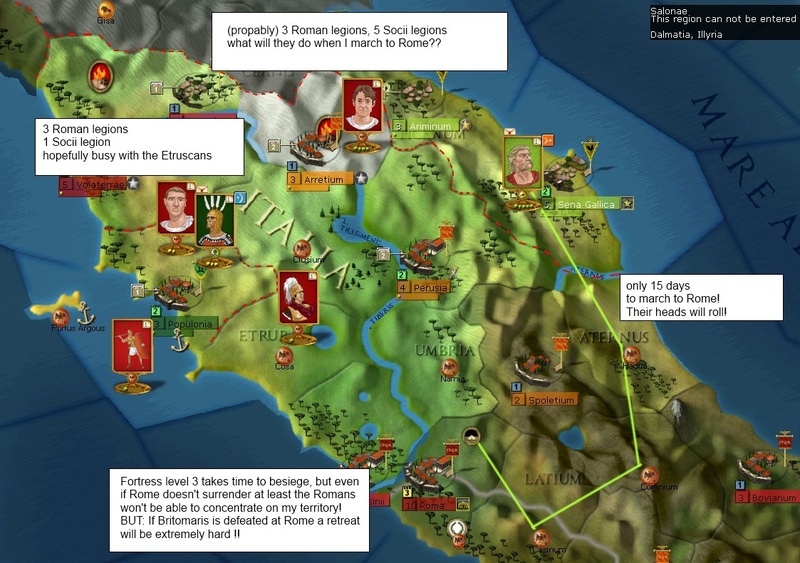 For all I care, this distraction has worked quite well: the Romans are too weak to attack Britomaris while they are busy with the Etruscans and this is good because I don't have any money for replacements! The Etruscans actually manage to fight for a stalemate this month! That is not bad considering the superiority of the Roman legions. Arretium, Perusia and Spoletium form a chain of forts that protect Rome from any attacks. I could take Spoletium, but it would allow the Romans to call in a dictator who could dig in in Rome and meet my forces the next month already so that would not be a good idea! However, there is a single province that leads to Rome without any fortresses in the way! Rome or death! In all seriousness, that "or death" is not just motivational speech here I don't see anyone getting back to Sena Gallica when we are defeated in front of Rome. Propably it would be best for me to just stay in Sena Gallica but what the hell – Britomaris was not born to defend! The Etruscans managed to fight for another draw. Not bad, I might have underestimated them! But now for the important part: Rome is besieged! Britomaris and his army made it to Rome taking nearly no hits from the march and now the 1750-strong force of 42.000 men is besieging Rome! The Romans are not impressed by my siege of Rome. They are concentrating on Sena Gallica for now, three Roman and five Socii legions besiege the settlement. There's no doubt that it will fall soon. At least this would unlock the Boii forces, giving me a new army that is nearly as strong as Britomaris army. After a series of battles this turn the Etruscans are nearly completely wiped out with light Roman casualties (4 element losses), only a single archer unit is remaining. The Etruscan leader (the "Lucumon") will try to meet up with Britomaris in Rome – alone. The reason is not that he is a great leader, in fact he is terrible with his 3-1-1 stats and a trait that lowers the cohesion of units under his command! But I need him to join up with the Boii army once it unlocks to get rid of the command penalty. The Roman garrison has a strength of 1020, hopefully no match for Britomaris should they attempt to break the siege. Three ongoing sieges, no combat this turn. In Populonia, the single archer unit and the militia unit of the Etruscans are besieged by four legions but no breaches were made. In Sena Gallica, eight legions are sieging and they made a breach this turn which might mean that Sena Gallica will fall next turn already. In Rome, nothing happened during the siege. 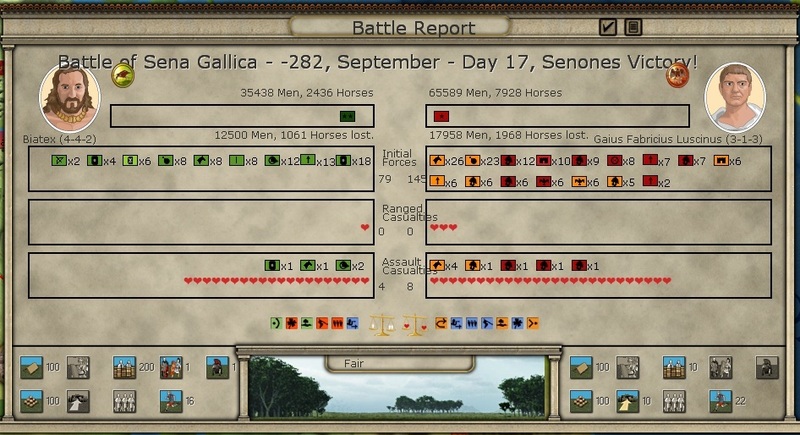 Grim news reach me: Sena Gallica has fallen... the Romans plunder the city and kill my people... my national morale is now very low at 72 and the Romans have a morale of 129... but it is not over yet! Britomaris army is undefeated and still besieging Rome! It's only a matter of time until they surrender! Time which I do not have by the way... the game is over in 7 turns already! If I don't take Rome I don't see me winning this. 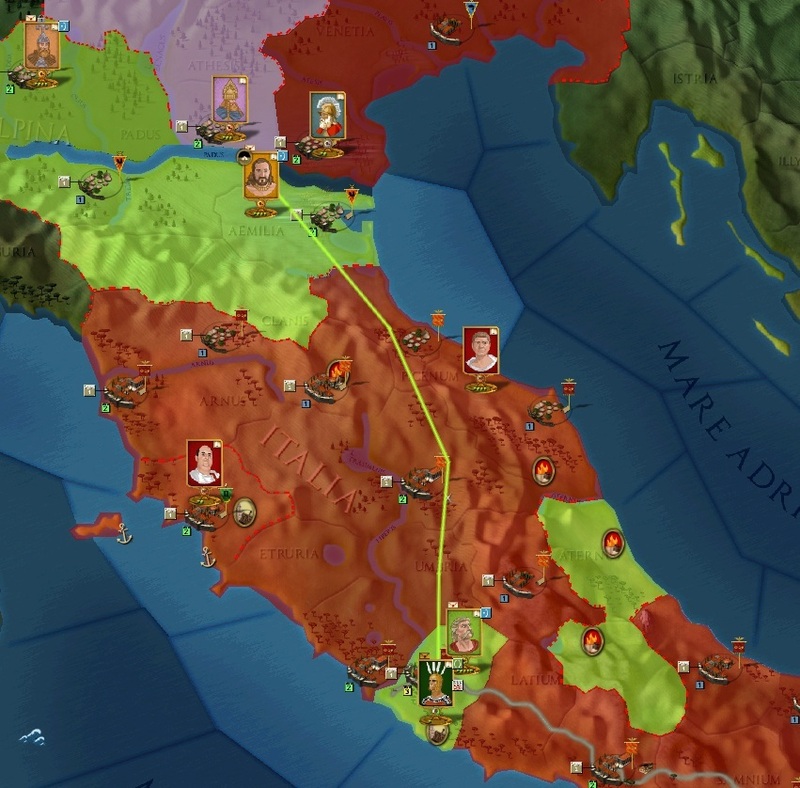 At least the Boii joined the war after Sena Gallica has fallen, but it doesn't really change the strategic situation because it allows the Romans in turn to call in their allies, the Venetii. They might also get the Cenomanii to join the war if I am really unlucky. Still, the Boii have an army nearly as powerful as Britomaris and the Etruscan Lucumon will join the Boii to get rid of the command penalty. 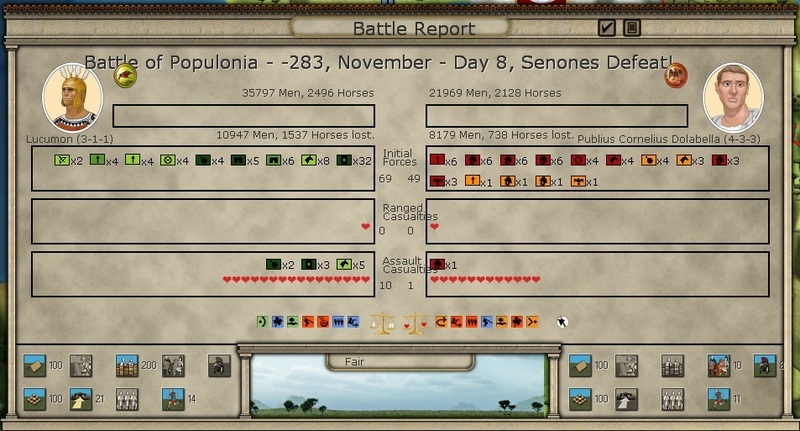 The Romans have massed their forces in Populonia, six Roman and five Socii legions in total, a huge force! I don't think I have any chance of defending against all those troops. On the other hand, I have nowhere to go anyway and Britomaris' supplies are slowly becoming scarce. At least I can give the Romans a good fight before I'm going down! 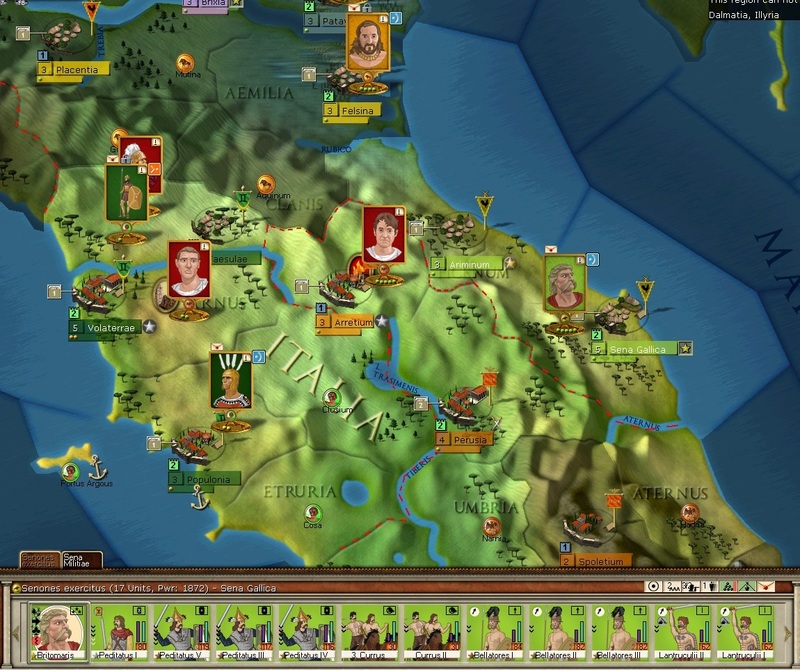 Great news: Britomaris actually manages to hold – against ELEVEN legions, six of them Roman! 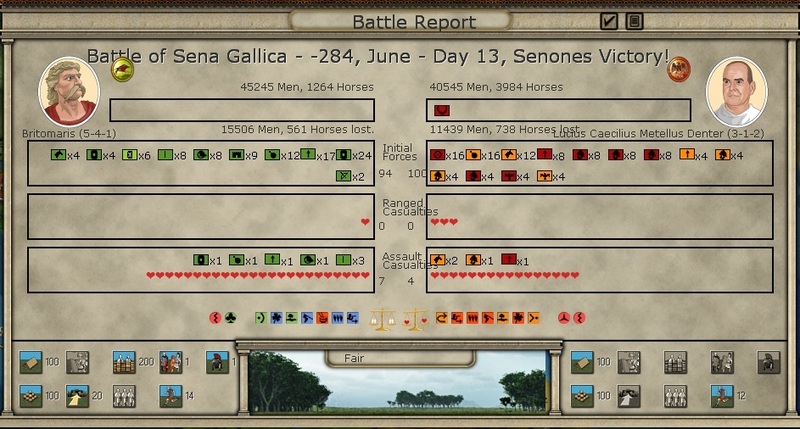 Contrary to my expectations, the Romans actually tried to relieve Sena Gallica this turn.. and even more contrary to my expectations, they failed again! Considering the vast difference in army size this is indeed surprising but certainly welcome. What a war! I have won an unexpected minor victory even though I neither took Sena Gallica back nor captured Rome.